The 2017 Alabama Angus Association Officers and Board of Directors. Seated from left are 2017 President-Jennifer Lee, Daviston; 1st Vice President-Chris Wisener, Arab; 2nd Vice President-Mr. J.B. Turner, Harvest; Treasurer- Cobie Rutherford, Starksville; Executive Secretary-Mike McGuire, Waverly; and the vacant seat in honor to the late Tim West, 2016 President. 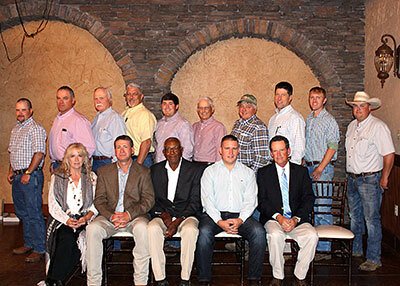 Directors standing from left are Michael Rorex, Bridgeport, AL; Randy Crowell, Elrod, AL; Richard Dyar, Crossville, AL; Len Colvin, Bridgeport, AL; Jay Howard, Oxford, AL; David Osborn, Athens, AL; Robert Williams, Section, AL; Rob Adams, Union Springs, AL; Zane Troxtel, Geraldine, AL; and Craig Bryson, Titus, AL. Photo by Mark Sims, American Angus Association.